Geneva and Latvia based Retail FX brokerage group Dukascopy continued its fairly weak performance from 2017 into the first half of 2018. 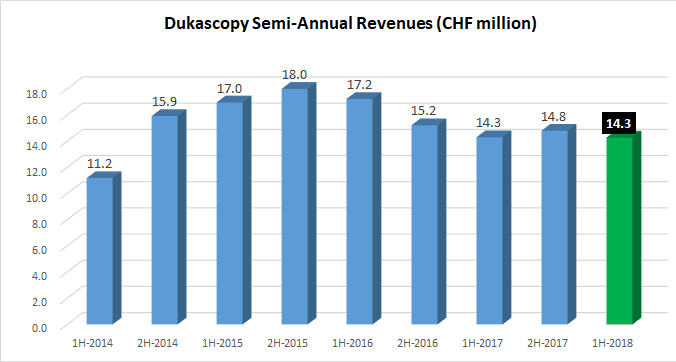 After posting a $2.4 million loss in 2017 amid a 12% Revenue drop, Dukascopy posted Revenues of CHF 14.3 million (USD $14.8 million) in the first six months of 2018, down 4% from CHF 14.8 million in 2H-2017, and flat from 1H-2017. The company posted an Operating Loss of CHF 41,000 and Net Loss of CHF 187,000 for the period. No update was provided for the company’s trading volumes, but after remaining fairly steady in 2017 at about $55 billion monthly we assume that they remained at about that level so far in 2018. 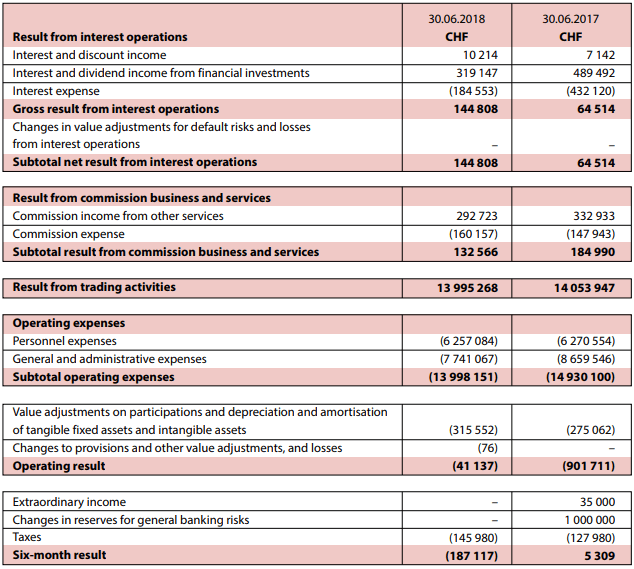 Dukascopy’s Client Deposit balances also continued to fall, although marginally, in 2018, sitting at CHF 100.3 million (USD $103.6 million) at June 30, 2018, down from CHF 101.1 million at year-end 2017. That follows a fall in Client Deposits from CHF 144.5 million in 2015 to CHF 118.1 million at the end of 2016. The company said at the time that client deposit levels were negatively impacted by a withdrawal from a White Label partner and presumably by the massive rush on Bitcoin which left less money available for Dukascopy’s more classical trading instruments. Dukascopy eventually added limited crypto trading in 2018. Dukascopy’s results come in stark contrast to those of its main rival, and the only other licensed Swiss Bank which participates in the Retail FX business, Swissquote. Swissquote earlier reported record results for the first half of 2018, driven (in part) by crypto trading. Another interesting recent disclosure from Dukascopy is that it is (finally) giving in to client pressure and adding the MT4 platform from MetaQuotes. Dukascopy has been somewhat of an outlier in the FX world by offering clients its own in-house JForex platform. There are a number of other brokers who have developed or commissioned proprietary platforms, but most of them also offer popular third party pan-broker trading platforms, mainly MT4 or Spotware’s cTrader. That way a broker can attract traders from other brokers, while allowing the trader to remain with his/her familiar trading platform. Dukascopy is controlled by husband-and-wife team Dr. Andrey Duka and Veronika Duka, who own together 99% of the company’s equity. Andrey and Veronika Duka act as co-CEOs of the company.